Molybdenum is used mostly in steel and superalloys to enhance strength, toughness, thermal and corrosion resistance, and to reduce brittleness. Applications include high speed steels, stainless steels (especially to increase corrosion resistance), high temperature steels and in cast iron. It is used also in nickel, titanium and molybdenum base alloys for applications requiring high strength and stability at high temperatures such as heating elements, radiation shields, glass melting equipment and in jet and rocket engines. 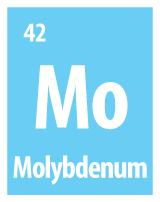 Demand for molybdenum is based on it being an important industrial metal. Demand is expected to increase. The New England Orogen in northern NSW is highly prospective for molybdenum. Scorpio Resources Pty Ltd (a subsidiary of Anchor Resources Limited) is currently looking for a large porphyry tungsten/molybdenum and or copper/molybdenum deposit in addition to an intrusion related gold deposit on its Exploration Licences in the New England region. Peel Mining Limited is exploring for gold, tungsten, molybdenum and copper in its Attunga Project area.